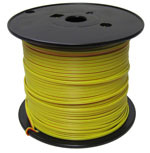 500 feet of yellow fireworks shooting wire. Also known as a scab wire. This is used to extend the length of your igniters. Easy to strip with your fingernails as well. 24 gauge solid copper wire. Yellow with a red a stripe. 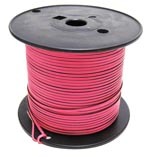 500 feet of pink fireworks shooting wire. Also known as a scab wire. This is used to extend the length of your igniters. Easy to strip with your fingernails as well. 24 gauge solid copper wire. Hot Pink with a black a stripe.